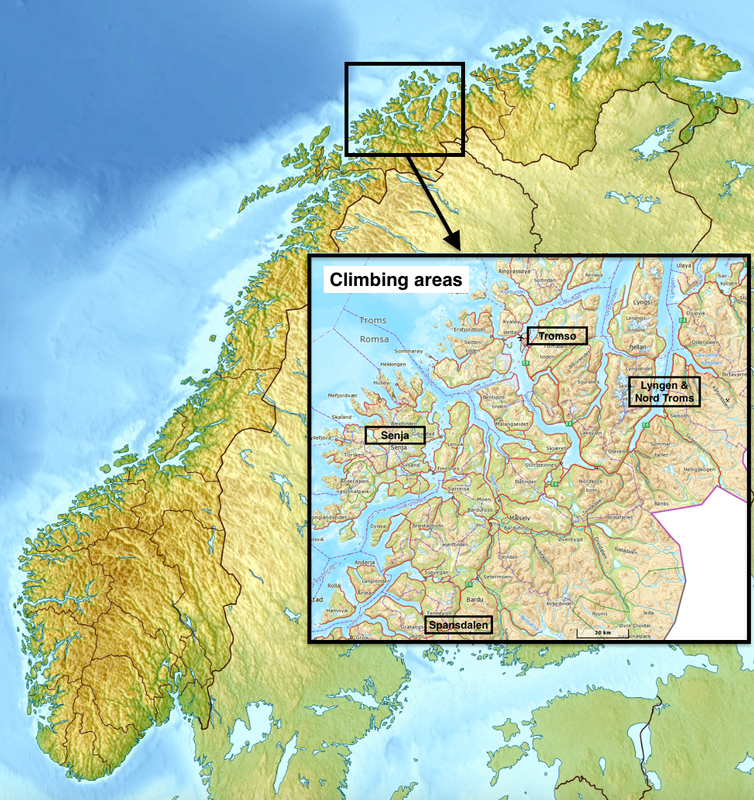 This North Norway Ice Guideblog mainly covers ice climbing in the area east of Tromsø including the Lyngen Alps, shown on the above map as Lyngen & Nord Troms. This area rivals anywhere else we have climbed including Canada, Rjukan and Cogne. We have visited the Lyngen area twice, for 6 weeks in total, in 2011 and 2017. The blog also includes climbs on the island of Senja and in the Sørdalen / Spansdalen areas, to the southwest of Tromsø, which we visited in 2012. There is quite a lot of info on these areas out there on the web, so we won't cover them here in any great detail. All photos were taken during those times. Oh, and in all the weeks in these areas we've only seen one other pair of climbers. You can forget about having to queue! We don't claim to be experts in the areas but figured that, as little information is available, some people may appreciate reading what we know. We're sure we have not found all the climbing. There will be plenty more to find if you have a sense of adventure. If you do discover more climbing, please let us know so we can include it in our plans for our next visit! Apart from Hattavarri we are confident that most if not all routes on this blog have been climbed before, mainly by Norwegian ice climbers who, over the years, have been motivated by adventure and have shown little interest in recording their own exploits. In the absence of any published route names we have given some route 'nicknames'. Please don't think of these as the official route name (if there were such a thing), it just helped us to remember what was what. For a more detailed account of our trips, have a read our blogs: Jim's blog and Nick's blog. As I have left some grumpy comments relating to those Austrians elsewhere in this blog, I should add here that I like your approach and appreciate the way you present this information. I expect it will be quite useful to other visitors. Thanks Stein - I hope you don't feel we are treading on anyone's toes, that's not the intention at all! I know you local guys keep it on the 'down low' and we didn't mean to inadvertently rename everything. I have amended as per your comments and please, if you have any more, fire away.